Domo, a provider of a cloud-based business intelligence and real-time data insights solution, filed for a $100M IPO. The company plans to trade under the ticker “DOMO” but did not commit to an exchange yet. Morgan Stanley is leading the offering. Domo was founded and is led by Josh James, a veteran entrepreneur that also founded and sold Omniture to Adobe for $1.7B in 2009. The company calls their offering an “operating system that powers a business” and has a focus on bringing data from any company data silo together to empower employees, and has a particular focus on CEOs. 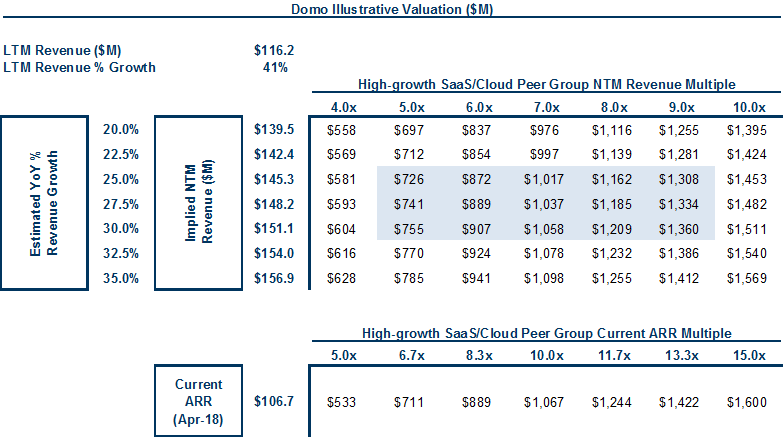 The company says they “enable CEOs to manage their entire company from their phone…this is possible because Domo digitally connects all the people, data and systems in an organization.” Continuing the flurry of SaaS/cloud IPOs this year, Domo is now the 12th. The company was founded in 2010 with the original name of Shacho, then was called Lightstorm, and in 2011 changed their name to Domo. The company is based in American Fork, Utah, and has 796 full-time employees. Domo has 1,594 total customers and 385 are “enterprise” customers, of which the company defines as customers with over $1B in annual revenue. A customer counts as an entity that generates at least $10,000 in revenue annually for Domo. 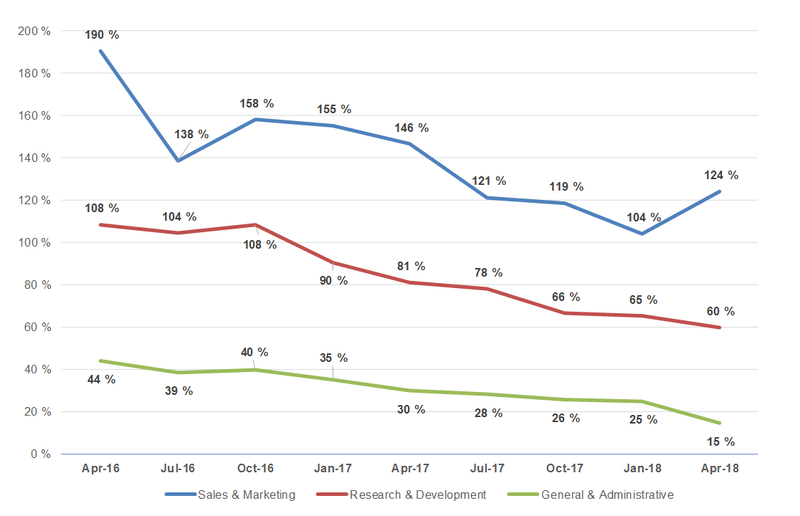 They are increasingly focusing their GTM (go-to-market) efforts on enterprise customers, where sales cycles are longer at ~6 months but have better unit economics. Their customer base includes 36% of the 2017 Fortune 50 as of the date of the S-1. Moreover, their enterprise customer base has grown from 36 as of January 31, 2014, to 385 as of April 30, 2018, representing 75% CAGR. Their average ACV (annual contract value) was $66.9K in the most recent quarter (implied ARR / number of customers), up 14% YoY. Based on the ratio of Domo users and total seats purchased from their top 20 customers (as of Jan-18), the company believes they are less than 4% penetrated in their existing customer base. On a typical business day, Domo customers in the aggregate typically query between 100 to 200 trillion rows from uncached queries. As of January 31, 2018, their 20 largest customers measured by ARR, had increased their investment by ~9x compared to their initial subscription. Those top 20 customers represent both enterprise and non-enterprise customers and accounted for 14% of total revenue in FY’18. Since inception through April 30, 2018, the company has invested $333.9M in research and development to build their solution. 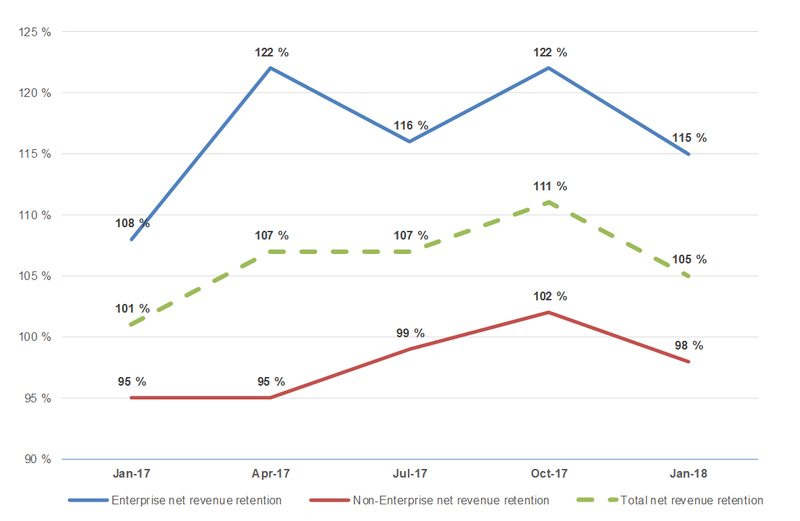 For FY’17, FY’18, and the 3 months ended April 30, 2018, enterprise customers accounted for 47%, 46%, and 46% of total revenue, respectively. For the three months ended April 30, 2018, Domo’s subscription net revenue retention rates were 105%, 115%, and 98% for all customers, enterprise customers, and non-enterprise customers, respectively. As of January 31, 2018, ~1,500 of Domo users in the preceding 90 days were C-level executives, of which over 400 were CEOs. 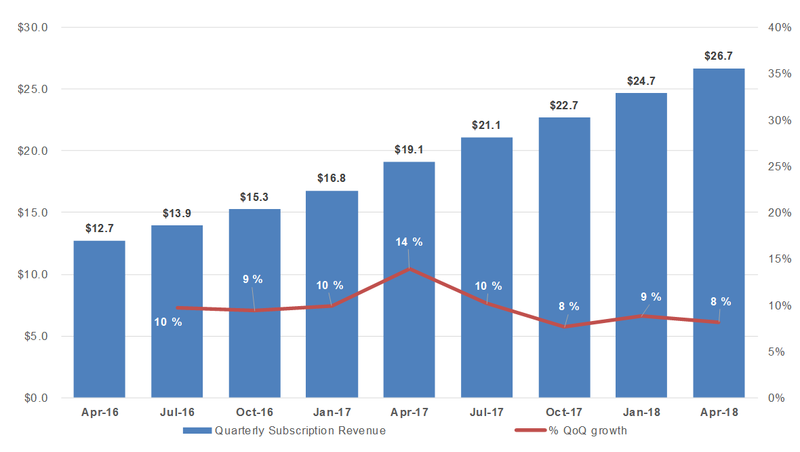 In FY’18 the company churned $12.4M of subscription revenue from the prior year’s cohort ($5M from enterprise and $7.4M from non-enterprise customers), which is quite high given the company came off a base of $58.7M of subscription revenue in FY’17. Domo is signing more multi-year deals, and in FY’18, 38% of new customers entered into multi-year contracts compared to 11% in FY’17. As of January 31, 2018, 32% of all customers were under multi-year contracts and 68% of all customers were under one-year contracts. No single customer represents more than 10% of total revenue. For the 2016 Cohort, the contribution margin percentage was (196%), 52% and 58% for the fiscal years ended January 31, 2016, 2017 and 2018, respectively. As of the most recent quarter, Domo had $71.1M in their backlog. Domo is committed to spending an aggregate of $60M between April 2017 and March 2020 pursuant to their agreement with AWS. Domo has a two-class common stock system where class A shares have 40x the voting rights of class B, with class A totally controlled by the founder, Josh James. 79% of revenue was generated from U.S. customers in the most recent quarter. Domo sells through a direct sales team and to a lesser extent through partners. Contracts are 1–3 years, and almost 70% of customers are on 1 year deals. Their subscription pricing is based on the number of users and the package tier. Domo sells to non-enterprise customers (less than $1B in revenue) through inside reps and field reps for enterprise customers, which are above $1B in revenue. Domo is also trying to transition the business towards more enterprise customers and non-enterprise customers that have at least $100M in revenue. Smaller customers can sign up for a free trial on their website. Domo calls their platform “seven start-ups in one” given the breadth and depth of their products. Their product is a business intelligence suite but they have also built out other features/products that aren’t common for BI tools, such as their own data warehouse and data ETL engine. The company has also built machine learning and artificial intelligence that can be used to trigger alerts and actions. The main tenants of the product are below and include enterprise-grade data management, permissioning, governance, and security on top of all the products. Connectors: Domo offers more than 500 connectors, also known as DomoBots, which are read/write, API and standards based connectors enabling users (and non-technical users) to connect to data across a broad range of sources. Data Warehouse: Data warehouse called Adrenaline, which stores all their customer’s data with sub-second response times on average. Domo ETL: Data transformation engine called Fusion, which is a self-serve product for data cleansing and data preparation. Data Analysis and Visualization: Analytics suite called Explorer that enables users to analyze, interact, and share data. Collaboration: Standalone collaboration and productivity suite called Buzz which integrates with Domo’s other features. It offers chat, sharing, org charts, profiles, and project management capabilities. Artificial Intelligence Algorithms: Machine learning, predictive analytics, and other AI tech called Mr. Roboto, which is used to create alerts, detect anomalies, and offer suggestions. Partner Ecosystem: Domo offers the Domo Appstore, APIs, and developer tool-kits for ecosystem partners to build applications on top of their solution. While Domo believes their solution can address any person with a mobile device, they operate in the business intelligence market that has traditionally served business analysts, data scientists, and IT personnel. IDC estimates this market was $24.4B in 2018. Moreover, given Domo believes their solution encompasses other markets where business intelligence products don’t typically focus, like data integration, data warehouse management, and collaboration, it represents another $20.4B of available TAM, according to IDC. The business intelligence market is large and quite fragmented — competition ranges from manual processes like Excel or SQL to enterprise-grade business intelligence suites. On the traditional BI vendors, the company says they compete with Microsoft (likely PowerBI), Oracle (Business Intelligence), SAP (Business Objects), and IBM (Cognos). 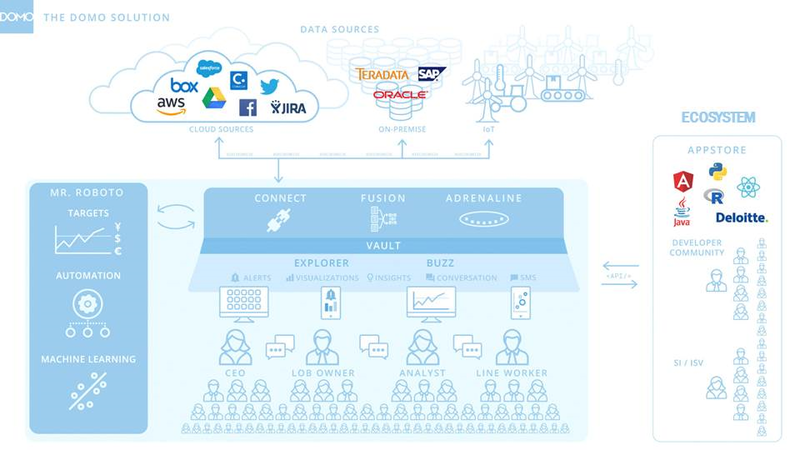 Domo buckets Tableau, Qlik, Looker, SiSense, and Tibco into competition from business analytics vendors and also say they compete with Salesforce and Infor. Tableau, an $8B market cap company, is likely the largest competitor as they are mostly focused on the department-level and business-user market, and given their scale probably run-up against Domo most often. Looker, on the other hand, offers a cloud-based platform with their own query language, enabling real-time “single-version of truth” business intelligence capabilities for enterprises, and could compete with Domo where customers want a single, enterprise-wide solution, and not just a department-level product. 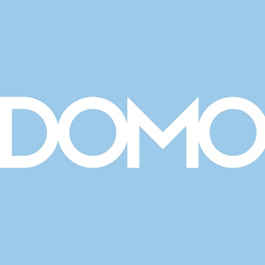 According to Pitchbook, Domo has raised $729.9M to date from investors including BlackRock, GGV, Benchmark, TPG, IVP, Zetta, Salesforce, T.Rowe, Greylock, and others. 5%+ pre-offering VC shareholders include IVP (12.9%), Benchmark (12.0%), BlackRock (10.8%), and GGV (6.7%). Josh James, Founder, CEO, and Chairman, is at a 4.5% pre-offering stake. 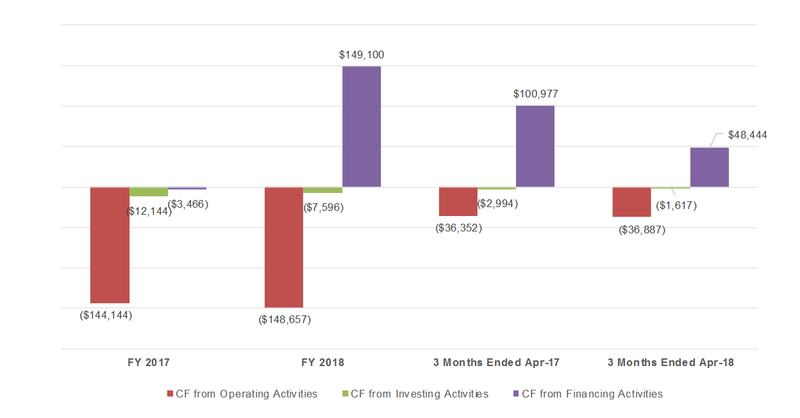 The company raised their last series D2 round of $115.1M led by BlackRock in December 2017 at a $2.2B pre-money valuation, according to Pitchbook. 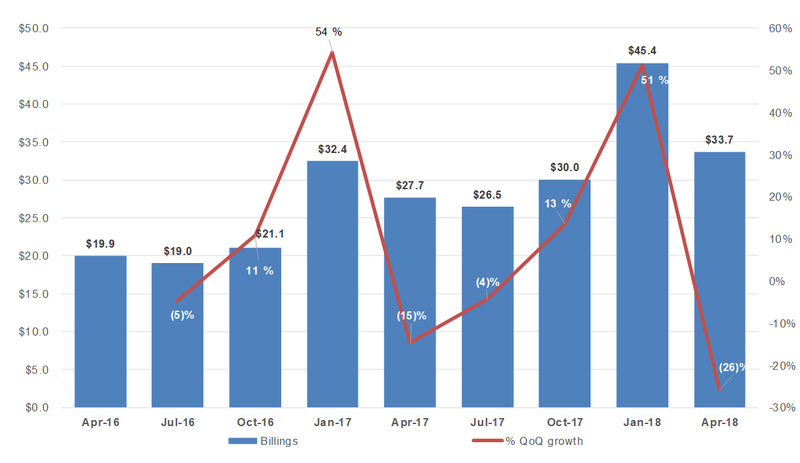 Domo is growing their implied ARR 40% YoY in the most recent quarter but has been decelerating year-over-year growth in each of the past four quarters. They are making significant investments in all areas of the business, and in particular sales and marketing, where they spent almost $40M last quarter and acquired 73 net new customers. 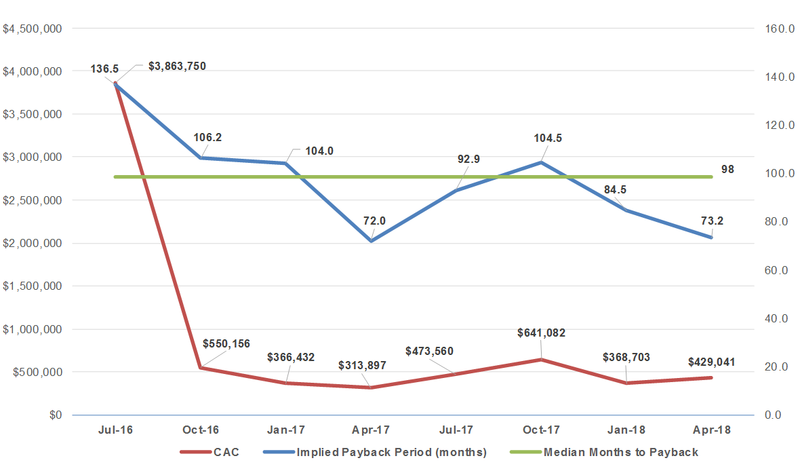 Their CAC per net new customer was $430K last quarter, and with an average ACV of $66.9K, they need to hold onto customers for a long time for them to be profitable. Moreover, given their blended net revenue retention rate was just above 105% last quarter, lower than most SaaS companies, they need to spend even more to grow. On the sales efficiency side, over the past 8 quarters, their median months to payback was 98. 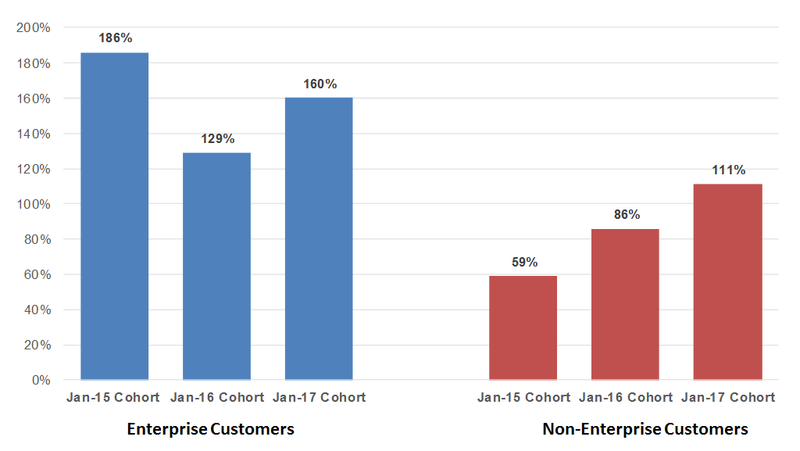 It’s no surprise they are focusing more on enterprise customers — while it’s more expensive and takes longer to acquire them, their Jan-2015 cohort is at 186% of its initial value. Domo recently drew down $100M from their credit facility and currently only has ~6 months of cash left with their current burn rate. Given they raised $730M in equity capital from investors and another $100M through their credit facility, it implies they have spent roughly $750M over the past 8 years to reach a little over $100M in ARR, an extraordinary and unprecedented amount of cash burn for a SaaS company. They have $72M in cash. For more context, Box, notorious for their cash burn prior to IPO, burned a little over $400M up until their IPO quarter (Pitchbook). Box’s implied ARR was also $233M. Domo is less than half the size of Box at $107M in implied ARR and has burned almost twice as much. Moreover, Domo states in the S-1 that the IPO funds will only offer another 12 months of operations, and if they don’t raise capital through an IPO they will look for other forms of financing, and if they don’t obtain any by August of 2018, they will reduce their operating expenses — reducing marketing spend and scope of their user conference, lowering hiring goals, and reducing discretionary spending. To put Domo’s customer acquisition spend in context, the below chart has the other 2018 IPOs and their implied median months to payback for their quarterly disclosure period using a CAC ratio (implied net new ARR * gross margin / sales and marketing spend of prior quarter). 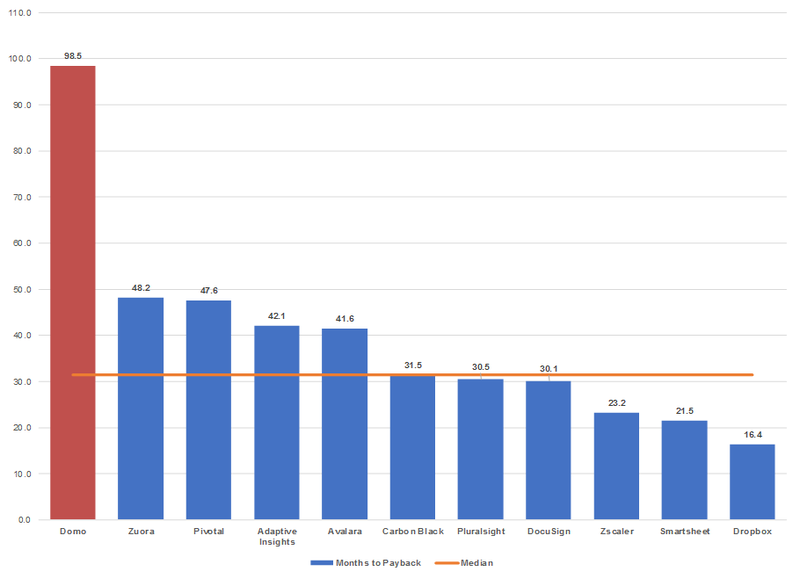 Not only does Domo have the longest payback periods, they are more than 2x the second longest, Zuora. The median is 31 months for this group. 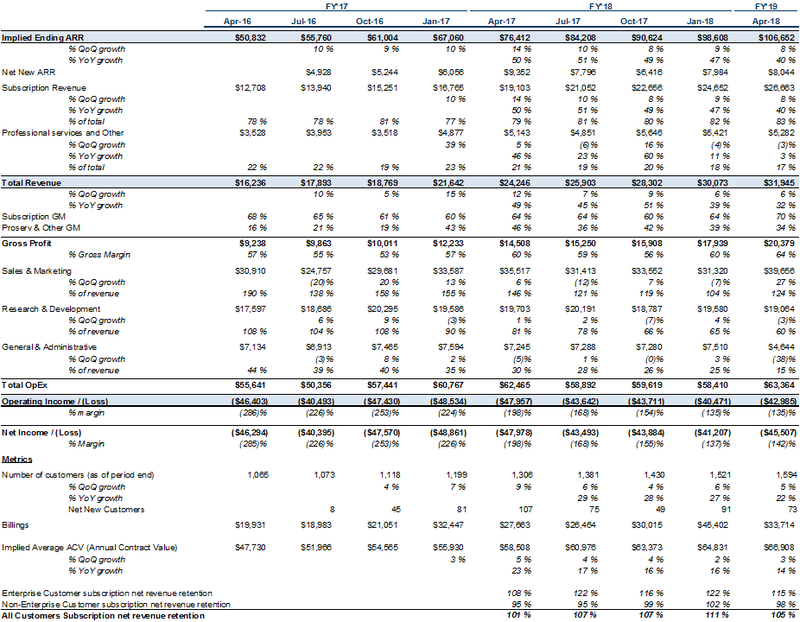 Outputs of other Domo financials and metrics are below. 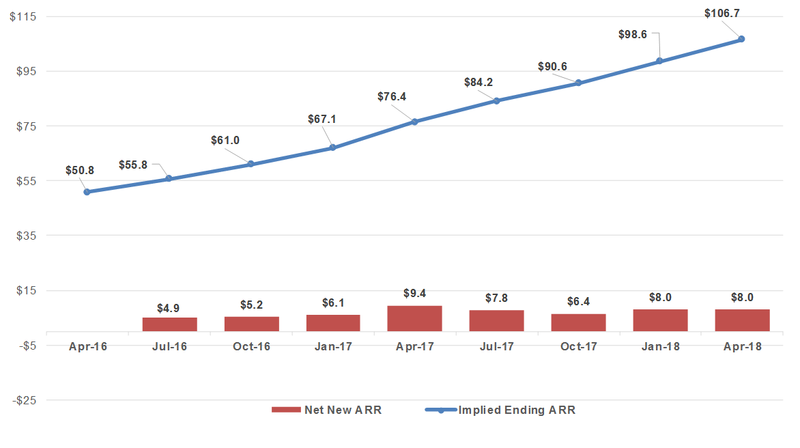 Domo has added $30.2M of net new implied ARR over the past year. As noted earlier, Domo does not grow efficiently and has a high CAC relative to their average ACV. 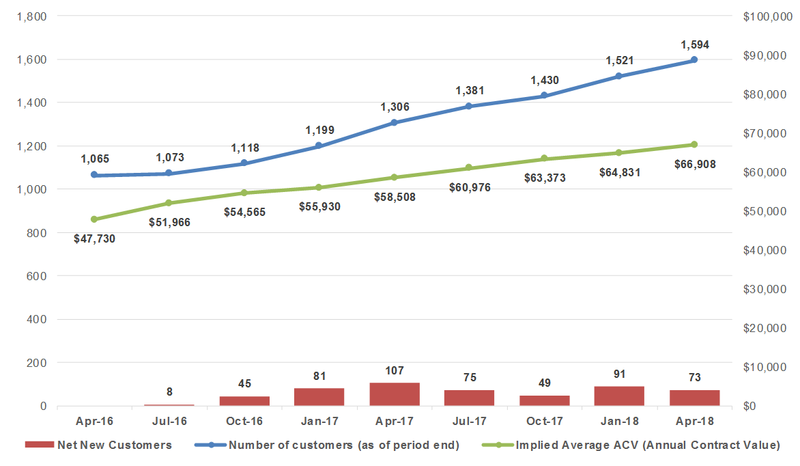 Apart from a blip in late 2016, it costs them $300K–650K to acquire a net new customer (sales and marketing spend / net new customers) with an average ACV of ~$67K (last quarter). Their months to payback is also very high, with a median of almost 100 months. Not surprisingly, Domo has better retention characteristics with enterprise customers. Domo’s enterprise cohorts upsell significantly more than their non-enterprise customers. For the 2016 Cohort (all customers), the contribution margin percentage was (196%), 52% and 58% for the fiscal years ended January 31, 2016, 2017 and 2018, respectively. Below are cohorts by year and segment as of Jan-2018. Domo will most likely be valued on a multiple of forward revenue. The output below uses NTM (next-twelve-months) revenue as a proxy based on an illustrative range of growth rates. Additionally, below is an ARR multiple range based on other high-growth public SaaS companies. Given the slowing growth, unit economics, and high burn, it’s not likely Domo gets a premium multiple. It would be surprising to me if they traded near their last round post-money valuation of $2.3B. Domo operates in the large and growing market of business intelligence software, and as more enterprises realize the need to be data-driven, the demand for their product will only grow. 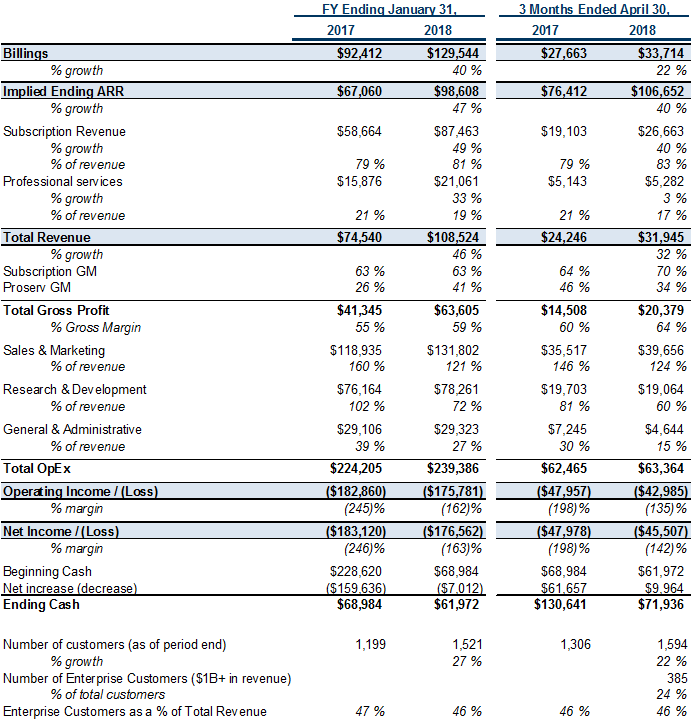 With that said, the company has unprecedented losses, slowing growth, and below-average unit economics for a SaaS IPO. 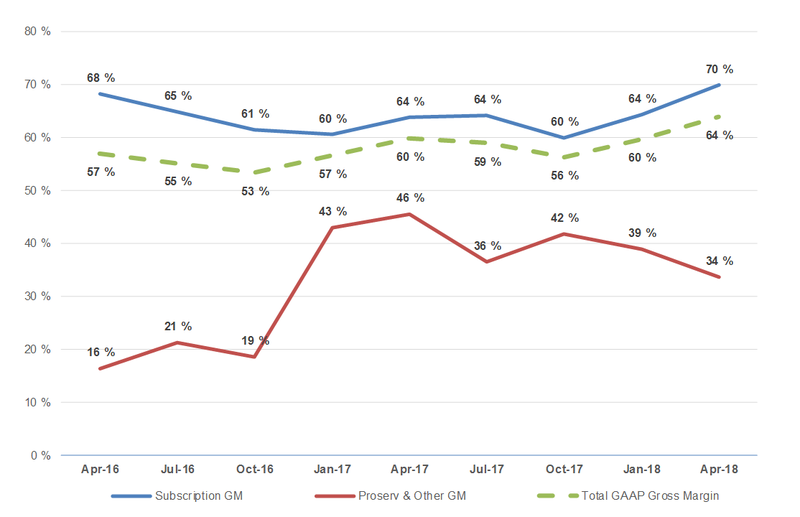 The bright spot in their metrics is the growing cohorts of enterprise customers, where Domo is increasing their GTM focus. The company does have a very experienced and proven founder in Josh James, and their plan to breakeven and/or profitability will be critical in them having a successful offering.